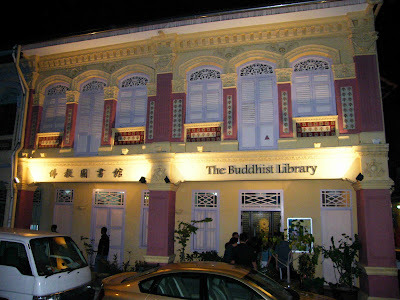 Screened at the Buddhist Library. This movie is simple, no “big-shot” movie stars, no over-budgeted advertising trick! What Eric Valli used in this movie are the breathtaking views of the Himalayas, the courageous caravan, and the completely non-professional cast (real chiefs, lamas and local villagers) which provide the film with a sense of “authenticity” that is not found in the “money-hunting” Hollywood products. “Himalaya” delivers a strong message that revolves around power, leadership ability, tradition, and change. A simple question: “When superstition, tradition and culture collide with our own conscience, what would you have done best to avoid conflict?” Probably we can make use of what is uttered by one of the main character in the film, Norbu: "When two paths open up before you, choose the hardest one." Talking about this, Bhante Dhammaratana (The Buddhist Library Spiritual Advisor) has opined that one should always take the hardest path. [This is my own view: there’s no easy way or short-cut in everything we do in our life (be it spiritual or secular). Obstacles in fact serve as our “spiritual teacher” that makes us matured over the course of time]. My principle is simple. I always respect the ancient belief system, even though some of them seem to me rather superstitious. They have survived for such a long time, there must be some reasons for them to exist until now. Some of them are simple innocent belief [for example, whenever someone has urgent toilet business, but there’s no nearby toilet can be found, he would have to settle his “business” at a nearby tree. Before doing this, we were always told during our childhood time that we must ask for “permission” from whatever “things” residing at that tree to allow us to proceed with our urgent business. For me, although this might sound superstitious, but it is a form of respect for all the living (and non-living) things in this world, who knows there might be a tree Deva at particular tree?]. However, if the practice of such belief systems become an obsession and start to disrupt my daily life, and could probably lead to the unwholesome consequences, I would not tolerate them, will try to challenge and clear the “clouds”. Cat's Play - Come back!